Nuclear Magnetic Resonance or simply NMR method developed separately in the year 1945 by American physicists Felix Bloch and Edward Mills Purcell for the spectroscopic analysis of substances. In NMR, a substance is put in a strong magnetic field which influences the spin of the atomic nuclei of some isotopes of common elements. A radio wave passes via the substance then reorients these nuclei. Whenever the wave is turned off, the nuclei discharge a pulse of energy which gives data on the molecular structure of the substance and that can be converted into an image via computer methods. Nuclear Magnetic Resonance spectroscopy (or NMR) is mainly concerned by the absorption of electromagnetic radiation in the radio frequency range through the nuclei of certain isotopes. Such isotopes behave as though they are spinning charged particles and produce a magnetic field all along the axis regarding which they are spinning. As an outcome, these nuclei can be pictured as tiny spinning bar magnets which in the deficiency of a strong external magnetic field are arbitrarily orientated in space. Whenever a strong external magnetic field is applied to such spinning magnets, the magnetic fields interact and the spinning magnets suppose various orientations in the external field. Each and every relative direction of alignment is related by an energy level. Only some well defined energy levels are permitted; that is, the energy levels are quantized. Therefore the nucleus can become aligned only in well defined directions relative to the magnetic field Bo. (Note: The symbol B is the SI symbol for magnetic field; most of texts still use the symbols H and Ho for the magnetic field). The number of orientations or number of magnetic quantum states is the function of physical properties of the nuclei and is numerically equivalent to 2I + 1. Here, 'I' is the spin quantum number. It is helpful to consider three kinds of nuclei. Nuclei having I = 0. These nuclei don't interact with the applied magnetic field and are not NMR chromophores. Nuclei having I = 0 encompass an even number of protons and even number of neutrons and encompass no net spin. This signifies that nuclear spin is a property characteristic of some isotopes instead of some elements. The most prominent illustrations of nuclei having I = 0 are 12C and 16O, the dominant isotopes of carbon and oxygen. Both the carbon and oxygen encompass isotopes which can be observed via NMR spectroscopy. Nuclei having I = 1/2. These nuclei encompass a non-zero magnetic moment and are NMR visible and encompass no nuclear electric quadrupole (Q). The two most significant nuclei for NMR spectroscopy belong to this class: 1H (that is, ordinary hydrogen) and 13C (that is, a non-radioactive isotope of carbon occurring to the extent of 1.06% at natural abundance). As well, two other generally observed nuclei 19F and 31P have I = 1/2. Altogether, NMR data for 1H and 13C account for well over 90% of all NMR observations in the literature and the discussion and illustrations in this module all refer to such two nuclei. Though, the spectra of all nuclei having I = 1/2 can be understood simply on the basis of general theory. Nuclei having I > 1/2. These nuclei encompass both a magnetic moment and an electric quadrupole. This group comprises some common isotopes (example: 2H and 14N) however they are more hard to observe and spectra are usually very broad. This group of nuclei will not be discussed further. Some nuclei notably 1H and 13C, can only take up two orientations in this field, a low energy parallel orientation in which the magnetic field of the nucleus is aligned in the similar direction as that of the external field and an antiparallel high energy orientation where the nuclear magnetic field is opposite to that of the external field. Under normal conditions there are slightly more nuclei in the lower energy parallel orientation as compare to the higher energy antiparallel orientation. A number of isotopes like 14N, 19F and 31P as well show nuclear magnetic resonance in a strong magnetic field. In case of 1H, where I = 1/2, the number of orientations is 2 x (1/2) + 1 = 2. As a result, for 1H only two energy levels are permitted, one having m = 1/2 and the other having m = - 1/2. The splitting of these energy levels in a magnetic field is termed as nuclear Zeeman splitting. Whenever a nucleus having I = 1/2, like 1H, is positioned in an external magnetic field, its magnetic moment lines up in one of two directions, by the applied field or against the applied field. This yields in two discrete energy levels, one of higher energy than the other, as illustrated in the figure shown below. The lower energy level is that where the magnetic moment is aligned by the field. The lower energy state is energetically more favored as compare to the higher energy state, therefore the population of the nuclei in the lower energy state will be more than the population of the higher energy state. The difference in energy between levels is proportional to the strength of the external magnetic field. The axis of rotation as well rotates in a circular way regarding the external magnetic field axis, similar to a spinning top. ω = the frequency in units of rads/s. Equation above is the Larmor equation that is basic to NMR. It points out that for a given nucleus there is a direct relationship between the frequency 'ω' of RF radiation absorbed by that nucleus and the applied magnetic field Bo. This relationship is the base of NMR. Absorption of electromagnetic radiation in the radio frequency region via 1H, 13C and other appropriate nuclei whenever placed in a strong magnetic field can cause the nuclei in the lower energy parallel state to spin-flip to the higher energy antiparallel state. Whenever this takes place, the nucleus is stated to be in resonance and the absorbed radiation is generally termed to as a signal. Nuclei don't stay in the higher energy state however dissipate their energy via so-called relaxation methods, the exact nature of which is not understood. If relaxation didn't occur, all the nuclei in a sample would ultimately be promoted to the higher energy state there would be non left to absorb the radio frequency energy. In another words, no absorption signal would be observed. Though this doesn't happen unless the sample is irradiated by radiation of such high intensity that all the nuclei are forced to remain in the higher energy state. In this condition the sample is stated to be saturated. Nuclear magnetic resonance spectrometers have to be adjusted in such a way that the intensity of the radio frequency radiation being used doesn't cause this to occur. Resonance can be brought about in two manners: either the external field can be kept constant and the radio frequency differed, or the radio frequency is kept constant and the external magnetic field differed. The former is termed as a frequency sweep whilst the latter is termed as a field sweep. In practice most of the instruments make use of a field sweep as it is simpler to accomplish a homogenous magnetic field. The quantity of energy required to cause nuclei to resonate based on the external magnetic field, the isotope and its molecular environment. For illustration, having an external magnetic field strength of 14,000 gauss, a radio frequency of the order of 60 megahertz (MHz) is needed to cause protons (1H nuclei) to resonate whilst a radiofrequency of the order of 25.14 MHz is essential to bring 13C nuclei into the resonance. The other field strengths can be employed; some of the instruments utilize field strengths up to 140,000 gauss. These machines are extremely sensitive however need very high radiofrequencies to cause the resonance. For illustration, a machine having field strength of 234,900 gauss employs a radiofrequency of the order of 100 MHz to bring 1H nuclei to resonance. As all the nuclei of an isotope are similar, one would wait for all the 1H nuclei to absorb at the similar frequency. Likewise, all the 13C nuclei would be expected to absorb at the similar frequency however a different one from the 1H nuclei. Though, this is not the case as the actual frequency of the absorption will based on the electrons in the structure that are as well affected via the external magnetic field (Ho). This field is assumed to cause the electrons to circulate the nucleus in a plane perpendicular to Ho. This generates a small magnetic field in the opposite direction to Ho that reduces the effect of the external magnetic field experienced via the nucleus. The nucleus is stated to be shielded. As an outcome, the magnetic field HE in reality experienced via a specific nucleus in the compound will be the resultant of the external magnetic field and the small opposing local fields because of the electron clouds of its neighboring nuclei. As each and every nucleus in a molecule is in a slightly dissimilar electron environment it will experience a somewhat different degree of shielding relative to the other nuclei in the molecule. Thus, each nucleus will need a slightly dissimilar radiofrequency to cause it to resonate. The resonance difference between the resonance of a nucleus and the resonance of the reference compound is known as the chemical shift. The resonance frequencies of 1H and 13C atoms are measured relative to the reference point, generally Tetramethylsilane (TMS). Tetramethylsilane is employed as an internal standard for both 1H and 13C spectroscopy as it consists of a single sharp proton absorption signal that takes place above the signals of most organic molecules. For ease, the spectra are recorded as plots of signal intensity against chemical shift where the chemical shift of TMS is randomly set at zero. Each 1H nucleus is shielded or screened via the electrons that surround it. As a result each nucleus feels the influence of the main magnetic field to a different extent, based on the efficiency by which it is shielded. Each 1H nucleus having a different chemical environment consists of a slightly different shielding and therefore a different chemical shift in the 1H-NMR spectrum. On the contrary, the number of different signals in the 1H-NMR spectrum reflects the number of chemically dissimilar environments for 1H in the molecule. Unless two 1H environments are exactly similar (by symmetry) their chemical shifts should be different. Whenever two nuclei have similar molecular environments and therefore the similar chemical shift, they are known as chemically equivalent or isochronous nuclei. Non-equivalent nuclei which fortuitously have chemical shifts that are so close that their signals are indistinguishable are known as accidentally equivalent nuclei. The chemical shift of a nucleus reflects the molecular structure and it can thus be employed to get structural information. Now consider the proton NMR of 2-methylpropanol below. The 6 alkane methyl protons are in the similar chemical environment and far away from the electronegative oxygen therefore little affected and therefore resonate at a chemical shift of 0.9 ppm. The six protons can be assigned as Ha. The methine (Hb) group is shifted downfield and consists of a chemical shift of 2.5 ppm. The CH2 (Hc) protons are shifter further downfield as deshielded via the electronegative oxygen and thus resonates at 4.2 ppm, whereas the OH proton resonates at ~3 ppm. Chemical shift 'δ' is stated as the ratio of the difference between the frequency of the signal and that of TMS (Hz) and the spectrometer operating frequency (MHz). It consists of no units and is generally recorded as parts per million (ppm). Chemical shifts in 13C NMR spectroscopy are much bigger than those found in 1H NMR spectroscopy. The chemical shifts of a spectrum recorded on a 60MHz spectrometer will encompass the similar values whenever the same spectrum is recorded on a 100MHz machine even although the absorption takes place at a different radio frequency for each and every instrument. Absorption signals which take place to the left of the TMS signal on the spectrum are termed to as being downfield of TMS or deshielded whilst those that take place to the right are termed to as being upfield or shielded. Chemical shift values are not only influenced by the nature of structure however are as well affected by hydrogen bonding, temperature and the solvent. Any effect that modifies the density or spatial distribution of electrons around a 1H nucleus will modify the degree of shielding and therefore its chemical shift. 1H chemical shifts are sensitive to both the hybridization of the atom to which the 1H nucleus is linked (sp2, sp3 and so on) and to electronic effects (that is, the presence of neighboring electronegative or electropositive groups). The chemical shift of a nucleus might as well be influenced by the presence in its vicinity of a magnetically anisotropic group (example: an aromatic ring or carbonyl group). Nuclei tend to be deshielded via groups that withdraw electron density. Deshielded nuclei resonate at higher ∂ values (away from the TMS). On the contrary shielded nuclei resonate at lower ∂ values (towards the TMS). Electron withdrawing substituents (-OH, -OCOR, -OR, -NO2, halogen) linked to an aliphatic carbon chain cause a downfield shift of 2-4 ppm whenever present at Cα and have less than half of this effect whenever present at Cβ. Spectrometers were originally designed to scan and record an NMR spectrum via progressively changing (that is, sweeping) the applied magnetic field at a fixed radio frequency (RF), or sweeping the frequency at a fixed field. Sample resonances were recorded as the series of sharp absorption peaks all along the frequency or field axis that is calibrated in ppm. These continuous wave (CW) instruments have been largely superseded via pulsed Fourier Transform (FT) spectrometers. Samples are subjected to a sequence of rapid, high-energy RF pulses of broad frequency range, between which a decaying emission signal from nuclei excited by the pulse and then relaxing to the ground state is monitored via the receiver circuit. The detector signal, or free induction decay (FID), includes all of the spectral information from the sample, however in the form of a time-dependent interferogram. This can be digitized and transformed to a conventional spectrum mathematically in less than a second via a computer by employing a fast Fourier transform (FFT) algorithm. Multiple interferogram can be rapidly accumulated and averaged to raise the sensitivity by as much as three orders of magnitude. a) A superconducting solenoid or electromagnet giving a powerful magnetic field of up to around 17 Tesla. 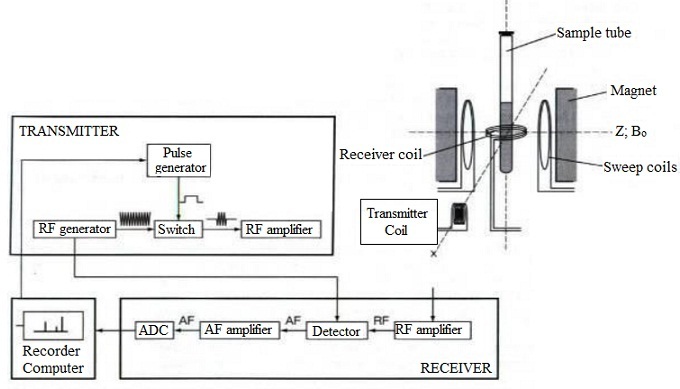 b) A highly stable RF generator and transmitter coil operating at up to around 750MHz. c) A receiver coil with amplifying and recording circuitry to detect and record the sample resonances. d) A sample probe placed between the poles of magnet. e) A dedicated microcomputer for instrument control, data processing (that is, FFT of interferogram) and data storage. The homogeneity and stability of the magnetic field must be at least 1 in 109 to make sure narrow absorption bands and good resolution. Sample tubes are made to spin in the sample probe at about 50Hz via an air turbine so as to raise the apparent field homogeneity further. The direction of the magnetic field and the orientations of the transmitter and receiver coils should be mutually perpendicular to detect the sample resonances and remove spurious signals in the detector circuit as illustrated in the figure above. Stability of operation is enhanced considerably via locking the field and frequency altogether to correct for drift. This is accomplished by constantly monitoring the resonance frequency of a reference nucleus, generally deuterium in deuterated solvent. For carbon-13 studies in particular, this is necessary, as accumulating large numbers of scans can take some hours.